An electronic kit with an acoustic feel. 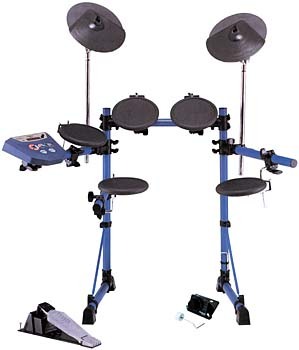 Includes one PD-80R V-Pad 8" mesh-head dual-trigger pad for both snare drum and rim shot sounds, three PD-80 8" mesh-head single trigger V-pads (great for toms), one KD-80 V-kick 8" mesh-head kick drum pad (usable with any standard kick drum pedal), three PD-7 dual-trigger pads for cymbal and hi-hat triggers, one FD-7 hi-hat controller, and an MDS-8 V-Custom stand with all necessary hardware. Comes with TD-8 sound module, which includes one,286 sounds (including a GM bank), COSM modeling-based sound editing, 64-voice polyphony, onboard sequencer, 800 patterns, effects and EQ, and positional sensing capability for triggering different sounds from different locations on the pad. Everything you need in a great sounding electronic kit with an acoustic drum feel.